Welcome to the world of Butterscotch and her friends. 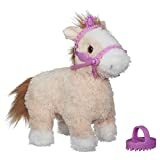 This sweet little pony pet is a soft and cuddly pal that walks and plays with you. She’s got a poseable head that you can move side to side, and a bridle for you to put on her when it’s walk time. After your walk is done, you can groom her to look her fanciest again with the included brush. Every trot will be an adventure with your Strawberry Rose pet. FurReal Friends and all related characters are trademarks of Hasbro.